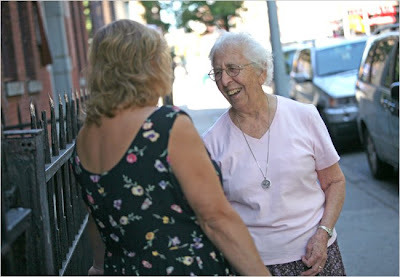 Whispers in the Loggia: "The Last of Her Kind"
"The Last of Her Kind"
After 47 years in ministry on the streets of New York, Sr Lucita Cangemi -- the city's "last working member" of her community, the Missionary Servants of the Blessed Trinity -- retired last week. Then again, anyone who knows women religious knows that the church's most selfless, intrepid, oft-unsung heroes (who, more often than not, have an uncanny ability for doing the impossible) never really "retire." And true to form, the 87 year-old social worker for Gotham's Catholic Charities won't so much be winding down, but keeping on in a new section of the vineyard: a parish in Mexico. Earlier this week, in her office on Stanton Street on the Lower East Side, Sister Lucita, 87, took stock of the changing worlds she has faced.... As she spoke, the phone kept ringing. Someone was coming up the steps to the front door. Taped to her computer monitor was a list of drug rehabilitation clinics. On her answering machine was a message from a city worker who needed help for a young woman with a baby. “I have a call now for Pampers,” she said. How was she supposed to come up with Pampers? “This is really not about me, but about the exodus of a community that has worked hard in New York, that loved New York and loved their work, and gave services to the city for 50 years,” Sister Lucita said. The base of their operations for many of those years was on the Lower East Side. Long before the clever restaurants and dress shops, the streets and tenements were home to poor people. The same human problems run across every class and culture, but on the Lower East Side, those problems lacked the insulation and camouflage that money can buy. Another member of the community who just retired, Sister Marion Agnes, worked to salvage abandoned apartment buildings through sweat equity, and more recently converted an old Catholic school into affordable housing. Sister Lucita spent her early years helping people in trouble with the law. She had an office on Lafayette Street, and the city’s Probation Department would send her people who had just gotten out of jail. She advised judges in family disputes. “There was a court which resolved, quote unquote, family problems between husband and wife when there was some kind of abuse,” she said. “There were times when I was able to really help them see what they were doing to each other, and whether it was a good idea for them to stay together, or apart,” she said. In the Women’s Court, she saw parades of women and girls who faced prostitution charges. “Very often, they would be caught by policemen who were pretending they were johns,” she recalled this week. And when decoys were not used, another class of witness was available: the men who had been patronizing the women. “The injustice of it,” she said. “When I first went there, the real johns would come and testify. ‘Did you give money for this?’ And the johns were exonerated, and the women went to prison. Some of the girls were so young. “There were some very compassionate judges, and if they thought there was a girl that could be helped, they would say to her, ‘Well, I’ll let you go and talk to Sister for a while, and maybe you two could figure something out and then tell me your plan,’” she said. That court closed in 1967. The city heaved and upheaved. The general prosperity has not made life any simpler. Instead, she said, “It has increased the problems of our poor,” who are tempted to surrender apartments for cash payments, or are pushed out by rising rents. Was it hard working in an institution where all the bosses were men? A very young woman pushed a baby stroller forward. “Are you looking for me?” Sister Lucita said. "Love" Coming Soon... in "Truth"?